When making these skirts all you need is some XL t-shirts of different colors or designs and your creativity. 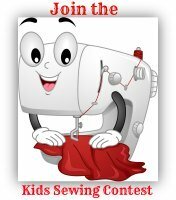 This tutorial will teach you how to sew a skirt with these t shirts. Using an XL t-shirt, cut t-shirt into two long rectangles by cutting from bottom up and across from below the collar. Make sure you cut through front and back of shirt. Measure around your hips and add 4-5 inches to the measurement. Cut your t-shirt rectangles to fit your measurement. Sew along side edges. Turn bottom edge of skirt up 1/4-1/2 inch and pin. Sew hem. Sew a casing for inserting elastic. Measure elastic around waist and add 1-2 inches. Cut length of elastic needed. Insert elastic into casing. Try on to make sure it fits properly. Sew elastic together backstitching several times to make secure. Sew 1 inch gap. From 3 separate t-shirts, Cut the following rectangles depending on your size. 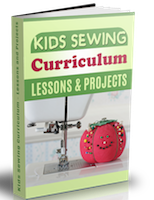 If you need to, sew two pieces together to equal the length needed. If you cut #3 along the bottom hem of your t-shirt the hem is already done for you. and up Continue to add 2 inches on each length for each year beyond. 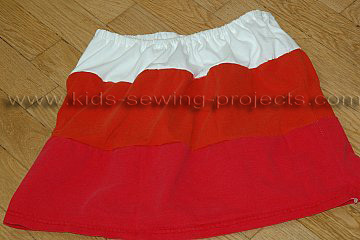 See our tiered t-shirt skirt for how to sew this project in a teen or adult size. 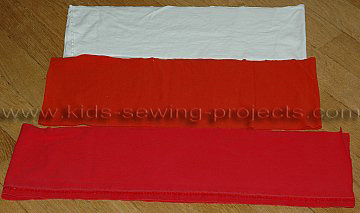 Once you've cut your rectangles from your t-shirts, sew a gather stitch on top of #2 and the top of #3. 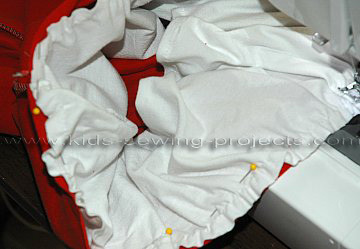 Gather skirt ruffle #2 and pin to match bottom of #1. Sew together. 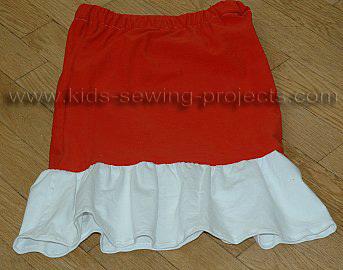 Gather skirt ruffle #3 and pin to match bottom of #2. Sew together. Use one or two XL t-shirts, whatever style or colors you like. 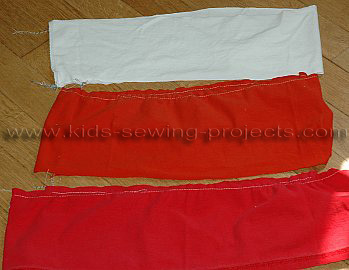 Cut t-shirt into long rectangle panels by cutting from bottom up along armpits and across the top below the collar. With a different t-shirt, cut a ruffle piece by cutting bottom of t-shirt about 4-5 inches wide or as wide as you would like. Include the hem of the t-shirt so you won't have to sew a hem later. Sew the two side edges of your top. Set aside. Gather stitch the top of the ruffle piece. Gather. With right sides together match gathered edges with bottom of top piece. Pin in place. Sew together. 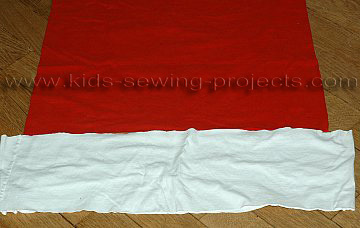 If you didn't cut ruffle piece on hem turn edge up and sew a hem. 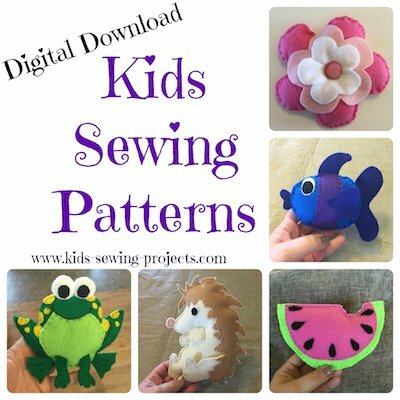 Sew a casing and insert elastic. If you have a closet of t-shirts you don't like anymore, try cutting rectangle panels out of your shirts. Starting along the sides, cut up the side and across the top. This pattern works great for t-shirts with designs or logos. You will sew your rectangle panels together, sewing as many together as needed to go around your hips and waist plus a few inches for stretch. Sew a casing on the top of your panels and insert elastic. 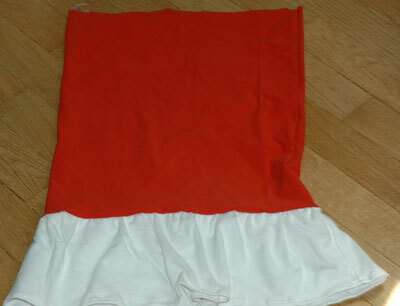 Check out the Recycled T-shirt Skirt Video for more ideas. Also check out how to change a t-shirt into a skirt. On to more skirt projects from t-shirt skirt.